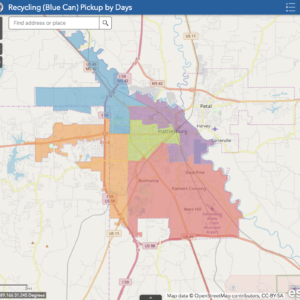 In Hattiesburg, recycling is a community value. It allows us to add to Hattiesburg’s story today and leave a lasting legacy for the Hattiesburg of tomorrow. Recycling at home is easy and can be accomplished by simply placing all recyclable items in the blue can instead of the green can. Hattiesburg’s recycling program is a fee-based, voluntary program. For an additional $3 a month on your water bill, you will receive a blue rolling cart and a welcome kit. If you would like to sign up today, fill out the form below. Note: If these items are seen in your cart during pick-up, we will not be able to collect your items. To report an issue with your garbage/trash/recycling pick-up or water/sewer services, please submit the concern to our action line. These requests will be opened as work orders for the responsible department and placed in the queue for resolving.